Today's Image of Mars shows a large depression in Deuteronilus Mensae, a region characterized by glacial features. The depression that is central to this image measures 2000m deep and 110km in diameter from north to south. This depression is eye-catching because it contains darker material than the surrounding terrain. 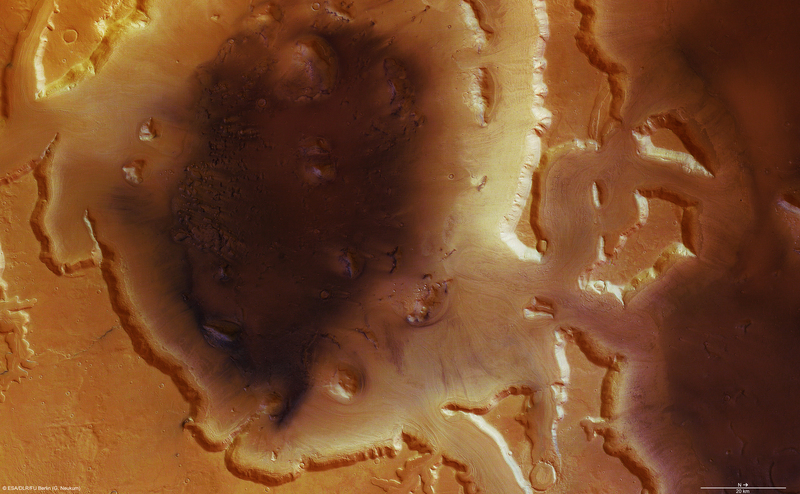 In this image you can also see valleys cut deep into the Martian surface. Scientists believe these valleys may have formed from intense melting of water ice, which then quickly froze and flowed down the slopes of the depression, much like a glacier. This was common on Mars when rising magma or impacts resulted in massive amounts of ground water erupting from underground reservoirs, only to be frozen in the frigid Martian temperatures. At least one glacier in Deuteronilus Mensae formed as recently as 10,000-100,000 years ago. Mars Reconnaissance Orbiter's radar have discovered that part of Deuteronilus Mensae currently contain ice, making the region a possible landing site for any future manned mission to mars.